Ace Perry is made from a base of 100% pure, local apple juice. Pear juice is added to give the cider its distinctive pear taste; a taste so fresh and natural it is already proving as popular as its more traditional apple counterpart. Ace Cider is gluten free! Ace Apple, CCC's flagship brand, is made with 100% pure, local apple juice giving it a fresh, natural taste and setting it apart from most other brands (not using 100% juice). 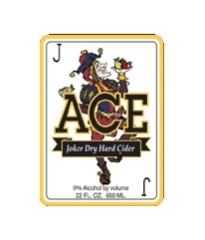 Ace cider is also gluten free! Light in color with a 8% alcohol content, this delicious addition to our foray of ciders can be tried on tap at our pub, Ace-in-the-Hole, or from 22oz bottles. The Joke is on us! Ace Cider is gluten free!